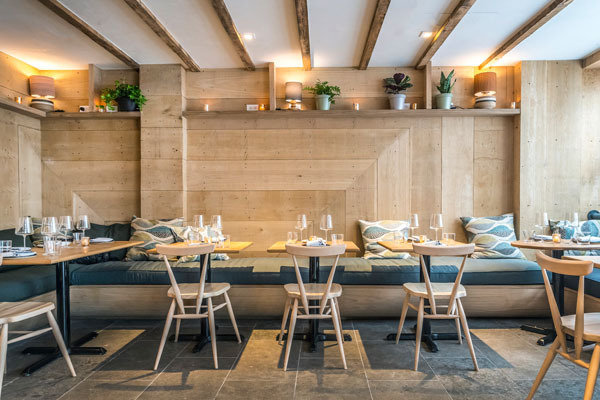 t this newly opened subterranean dining spot. A small low-ceilinged dining room seems spacious and airy, thanks to its light wood decor and open kitchen concept; and accommodates up to 40 guests at cozy tables with cushioned seating, lovely butcher block communal tables, or the chef’s counter where diners have front row seats and the best view of the kitchen. 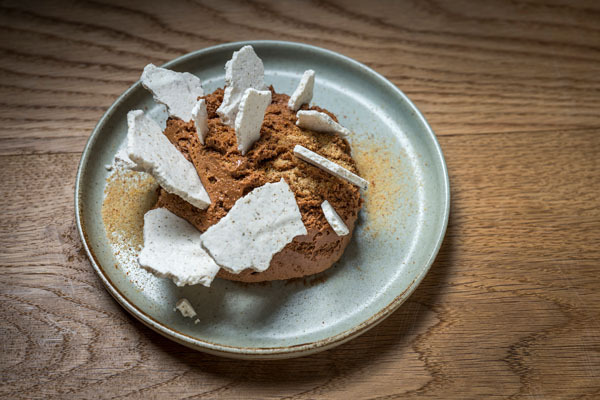 Chef Greg Proechel, formerly of Eleven Madison Park, Blanca, and most recently, Le Turtle, is a refined and thoughtful chef with a sharp talent for knowing how to combine flavors and artfully present composed dishes. At Ferris, his New American cuisine has many French influences as well as obvious Asian leanings with inclusions of yuzu, miso, and ponzu in several of the offerings; while the yogurt and succulent lamb that accompanied agnolotti stuffed with a pleasing burst of sweet creamy carrot filling gave an impression of Morocco. 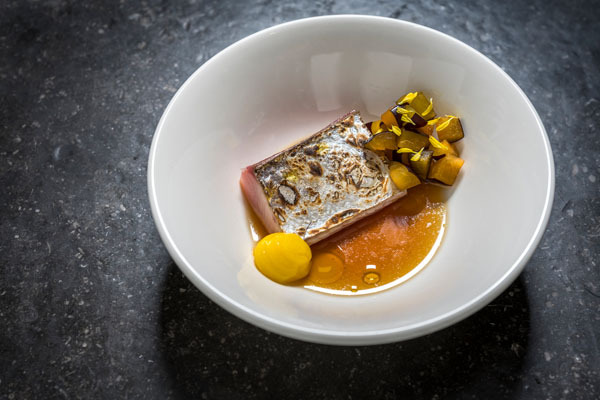 Minimalism showcases Chef Proechel’s talents best, as with his outstanding mackerel dish, served with an egg yolk nested by tiny pieces of Italian plum, and a delicate pool of ponzu. The fish was perfectly moist with a coveted crispy exterior, and proved to be a great bite with the yolk, plum, and sauce. 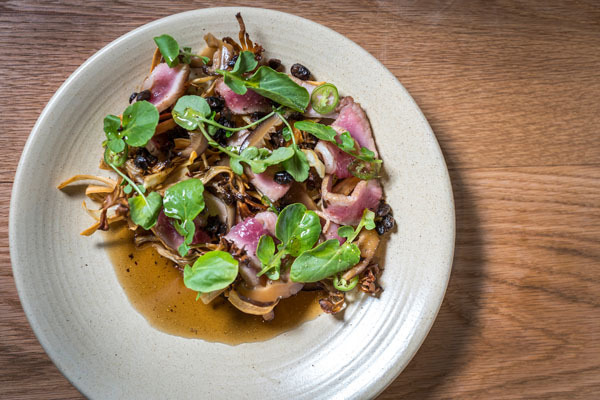 Additionally, a slightly aggressive char of eggplant jam provided a nice note to chunky slices of precisely-cooked duck breast and side of rutabaga; and we loved the charred broccolini with crispy brussels sprout leaves, yogurt, and cashews. 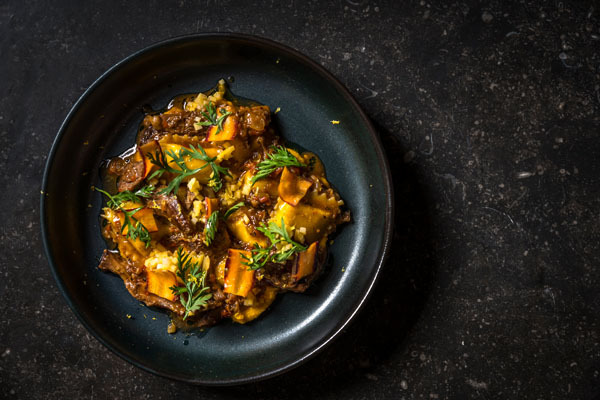 It is always nice to see seasonal vegetables celebrated, especially when the often undervalued sun choke is the star of an entree. Here, they are oven-roasted and served with smoked cabbage, and rounded out by sweet touches of blood orange and scallion miso. With nice varietals from the United States and Europe, the wine list is impressive; but it is the house specialty cocktails that steal the show. We especially liked a vodka, fennel, ginger, and lime drink called L’Amie that had a spicy kick and was playfully garnished with a big slice of fennel. To end the meal, we asked for something light, and received a heavenly palate-cleansing dessert of frozen yogurt, little fruit slices, and lime. It was a perfect and refreshing way to close out a fantastic meal. between Broadway and Sixth Ave.